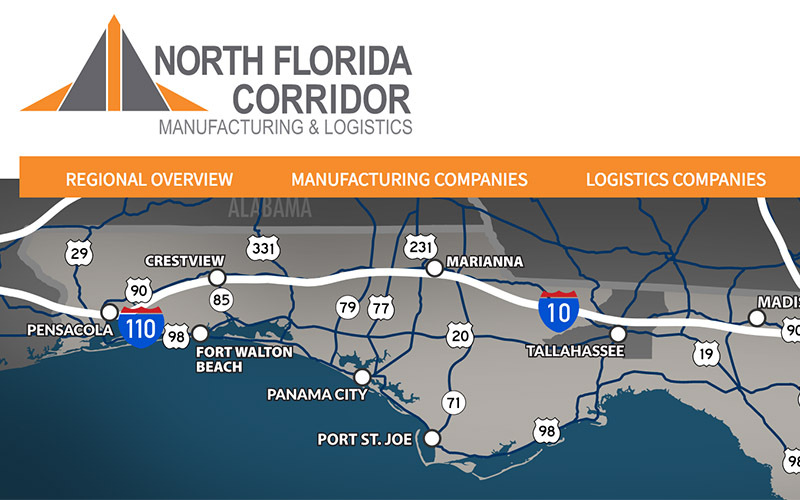 Today, four leading Florida regional economic development organizations announced the creation of the North Florida Manufacturing and Logistics Corridor to augment their regional efforts promoting corporate growth across 34 counties, from Pensacola to Jacksonville. Florida’s Great Northwest, Opportunity Florida, the North Florida Economic Development Partnership and JAXUSA Partnership have united to build awareness and generate opportunities for attraction and expansion projects in manufacturing, logistics and distribution and to attract the talent that seeks to work for such companies. By joining together, both urban and rural communities along the Corridor can showcase what the region offers in certified sites, a skilled and available workforce, accessible infrastructure, a competitive business climate and unmatched quality of place – leading to new jobs and greater economic prosperity for residents. The super region sits along 362 miles of Interstate 10 running east from the Panhandle of Florida, serving the major cities of Pensacola, Tallahassee, Lake City and ending at Jacksonville. Along the corridor are large swaths of available land and a number of shovel-ready and certified sites to support rapid development. Combined with a workforce of more than 1.5 million and more than 25 percent earning an Associate Degree or higher makes the region an ideal location for manufacturing and logistics companies large and small. North Florida has a rich history of success in manufacturing and logistics due to its integrated infrastructure from coast-to-coast, including deep water ports, international airports, rail lines and thousands of miles of interstate. The Corridor is already home to top named manufacturers such as Boeing, GE, Georgia Pacific, Johnson & Johnson and WestPoint Home, and major logistics and distribution centers such as Amazon, CSX, Family Dollar, Publix, Walmart and more. Start-up companies fueled by innovative technologies and a competitive cost of doing business also find success in the region. Access a Large Customer Base: Reach 20 million Floridians plus 58 million people within an eight-hour drive. Tap into a Workforce of 1.5 million: Ready and available talent with in-demand skills and military training. Move Product Quickly – Reach the entire Southeastern US through I-10, I-75, I-95; and leverage seaports reaching South America and Asia daily. Access Class 1 and short line rail with inland and intermodal ports. Influence Talent Pipeline - Partner with more than 60 universities, state colleges, and technical training institutions to build the future workforce. Learn more about the Corridor and visit the new website at www.NorthFloridaCorridor.com.